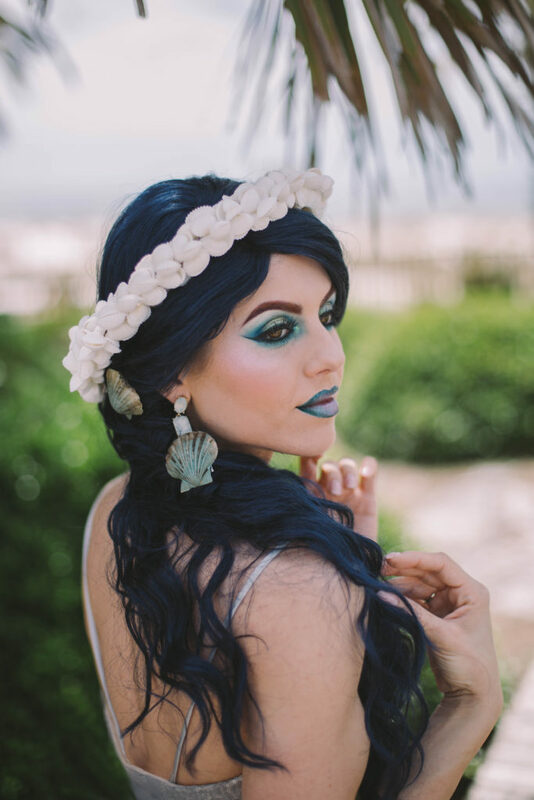 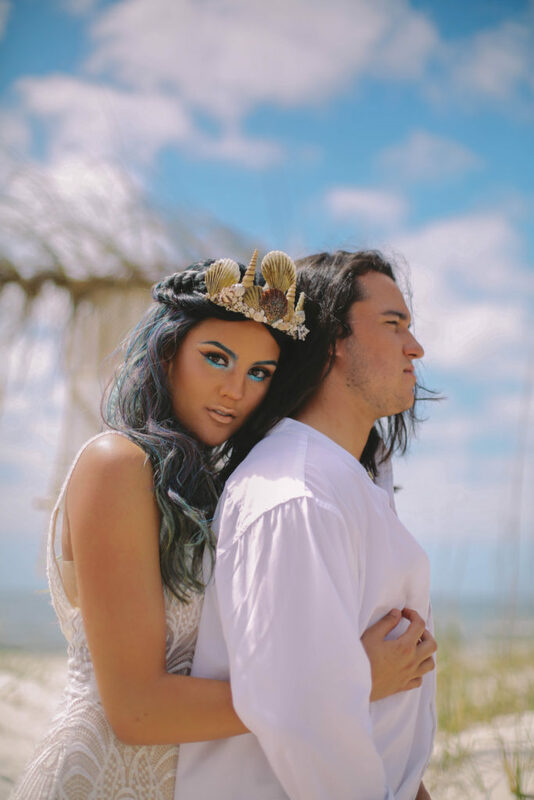 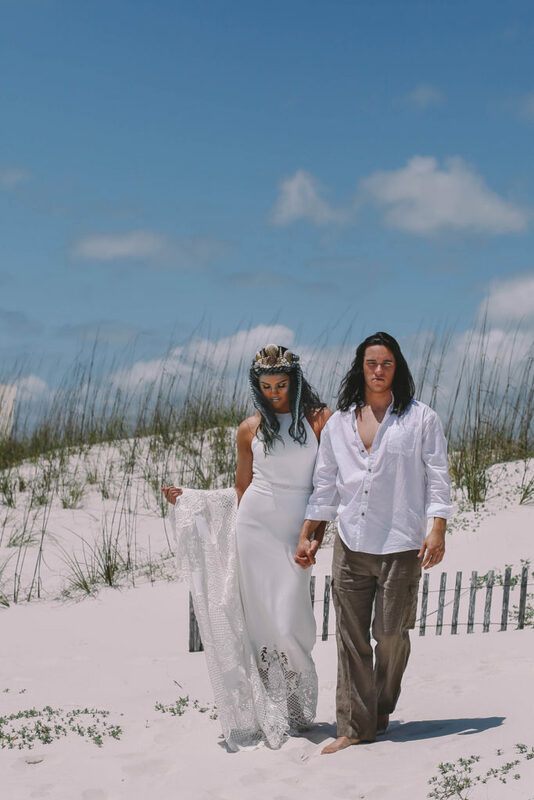 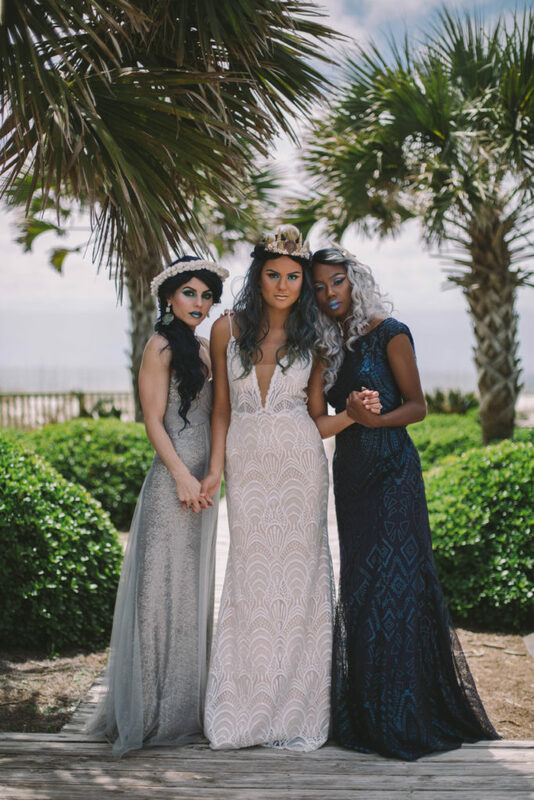 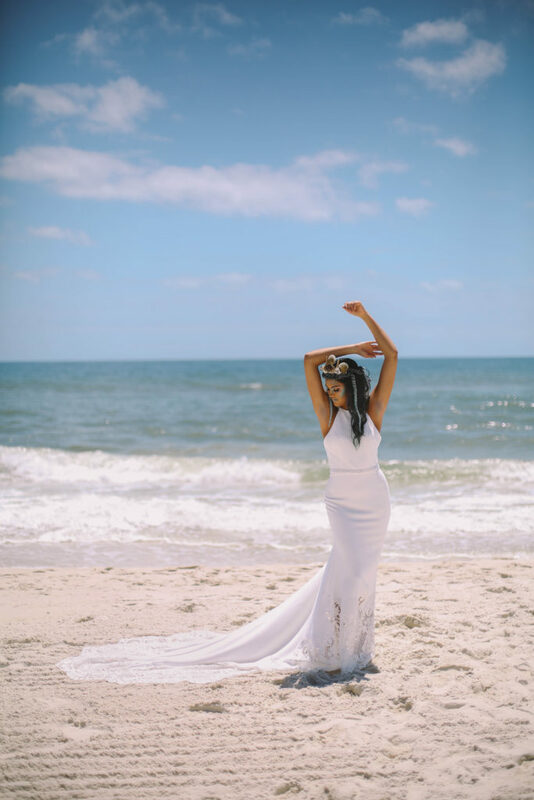 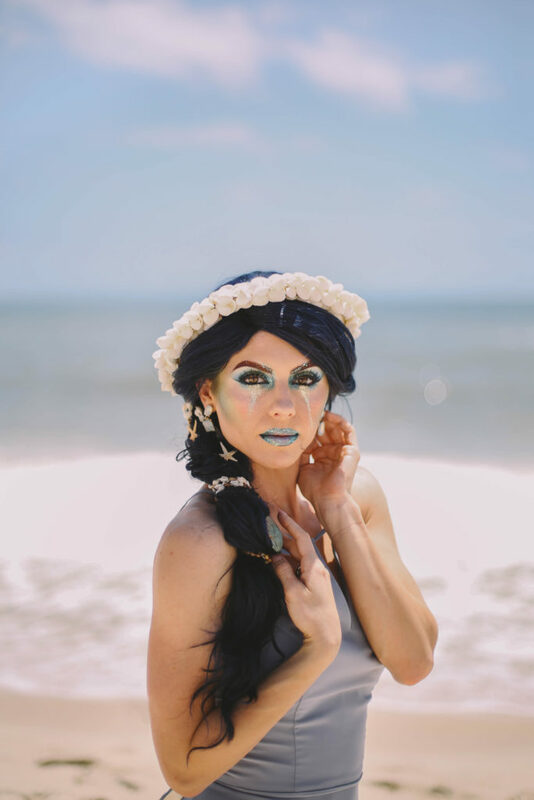 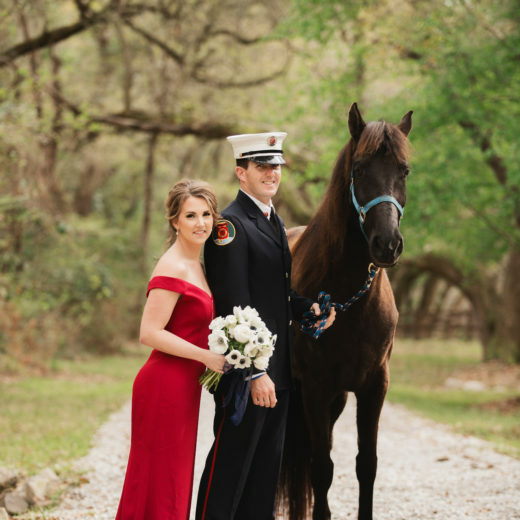 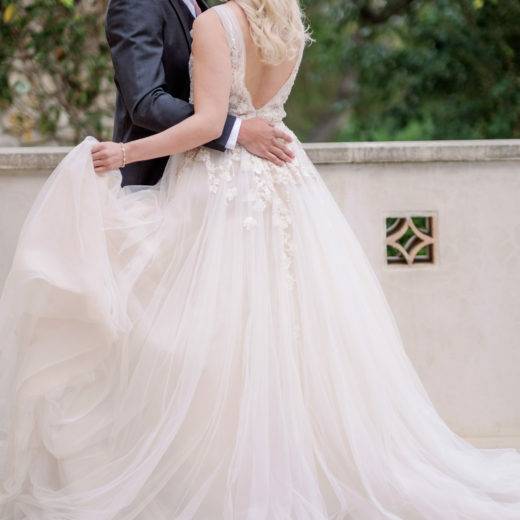 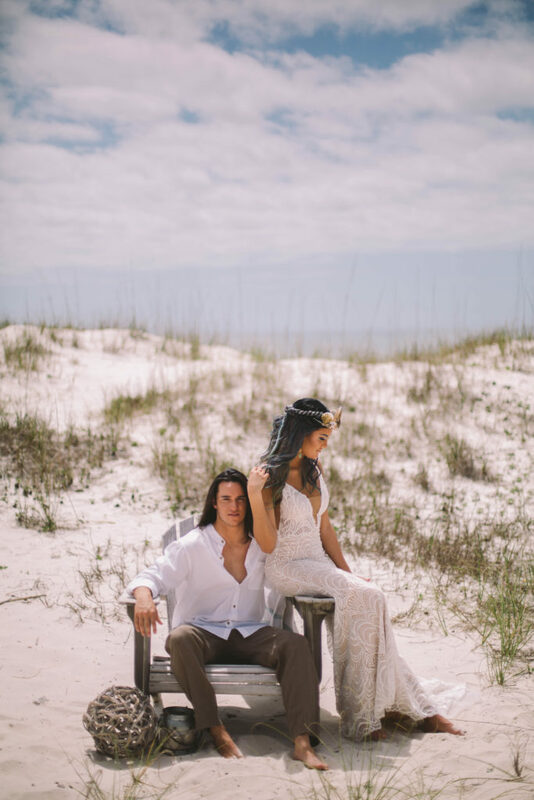 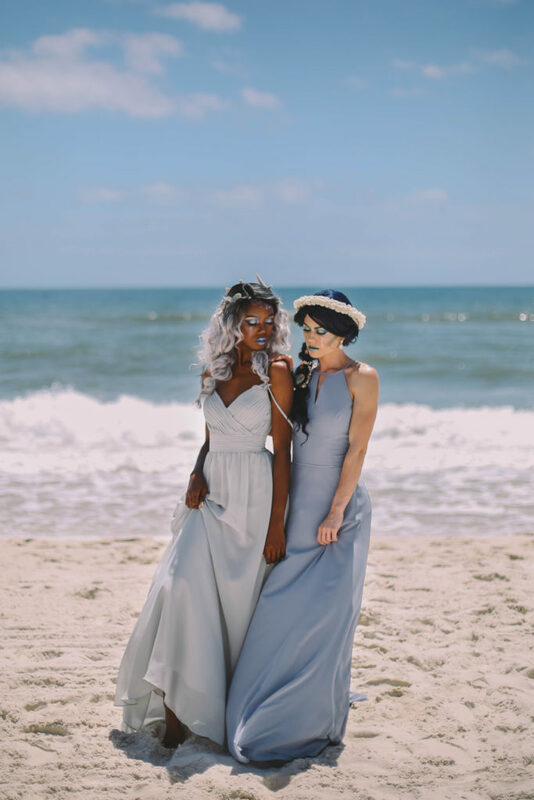 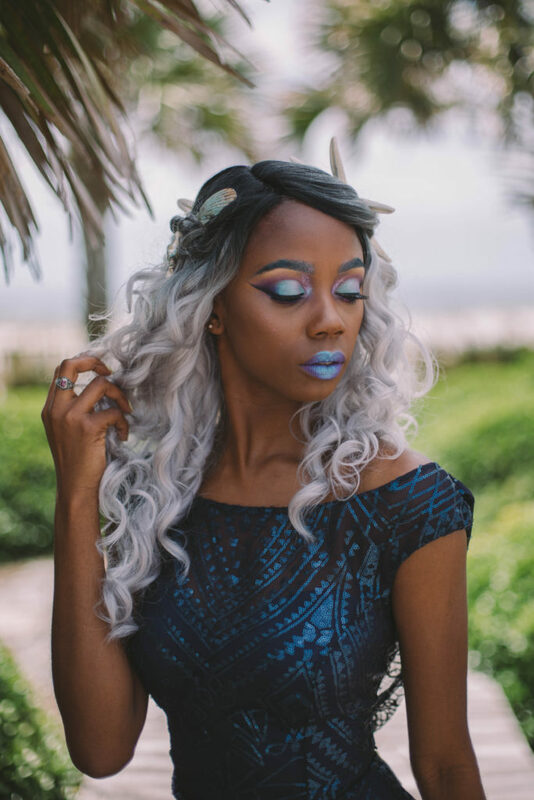 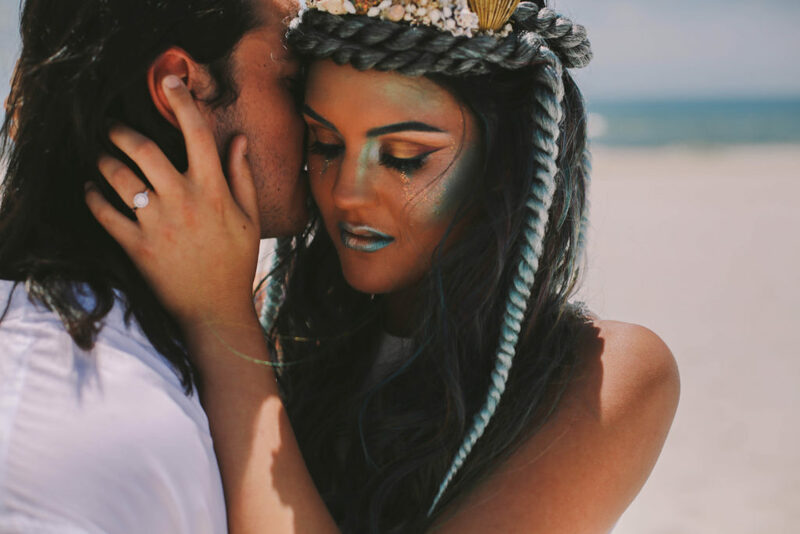 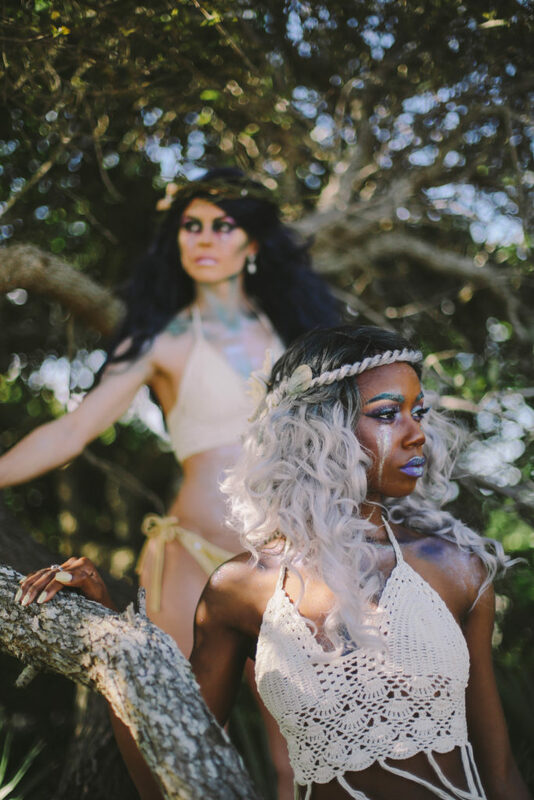 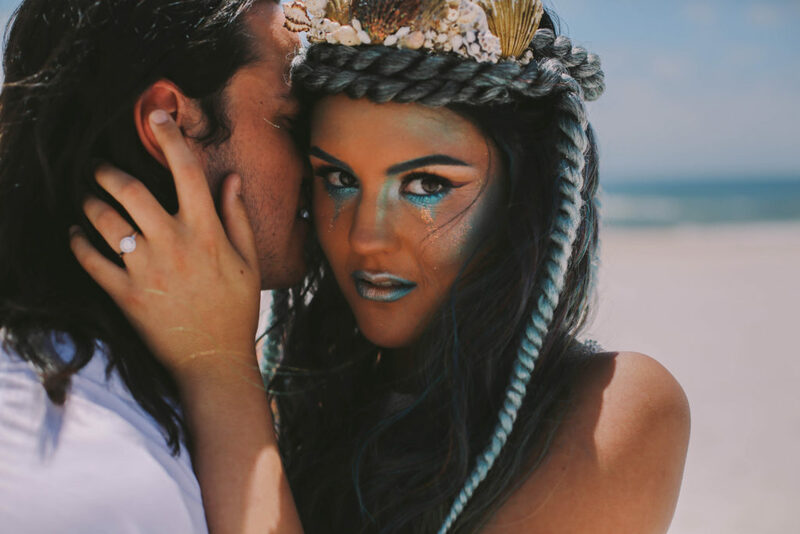 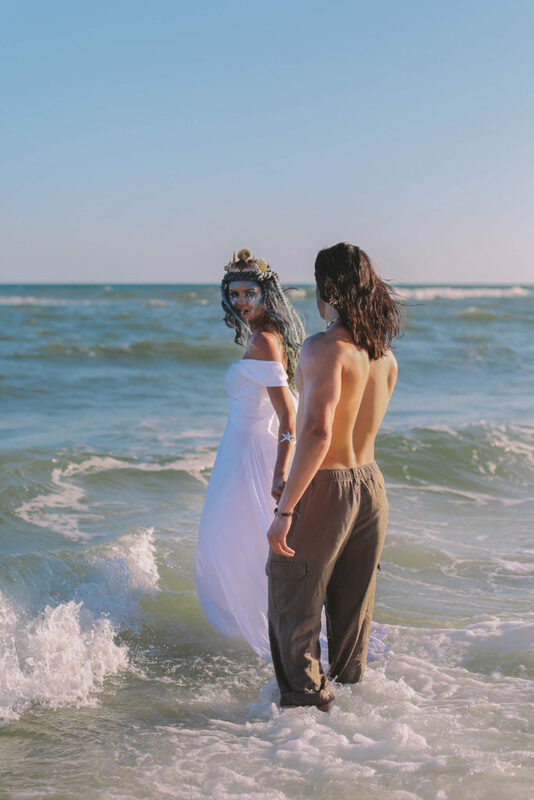 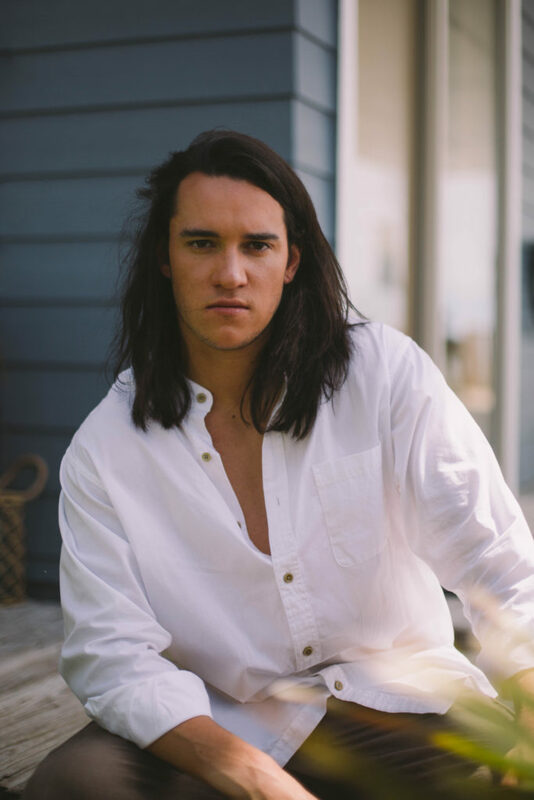 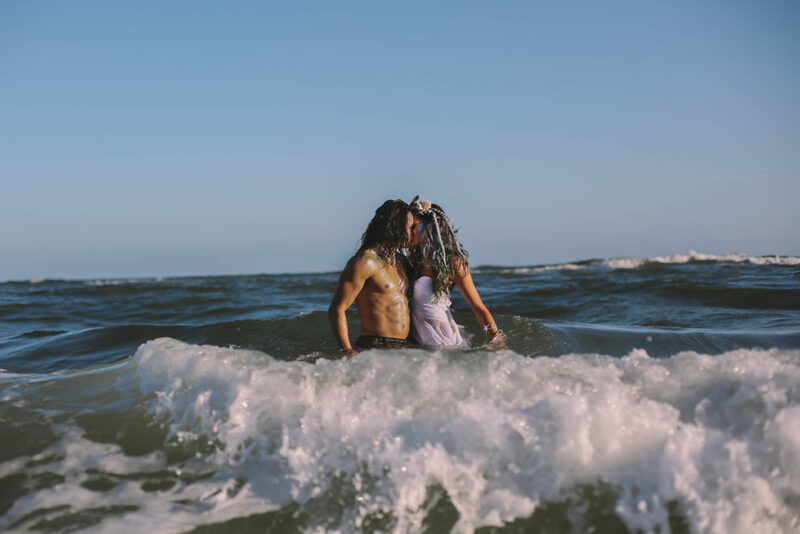 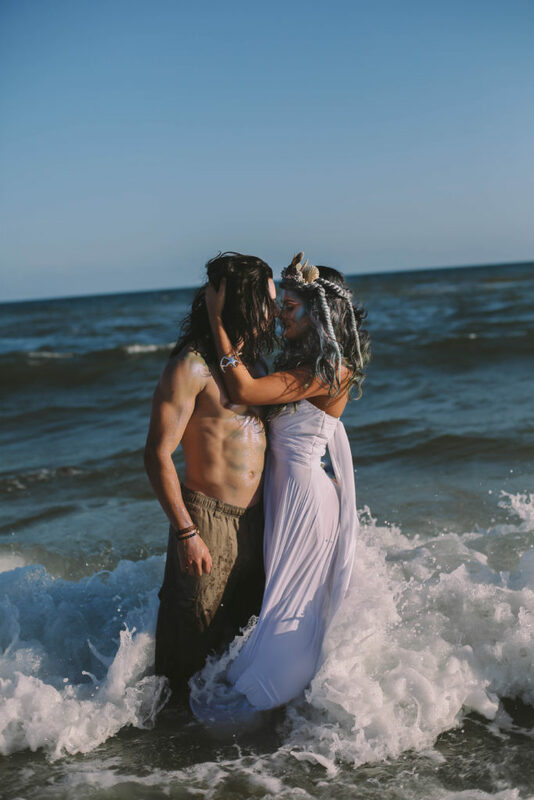 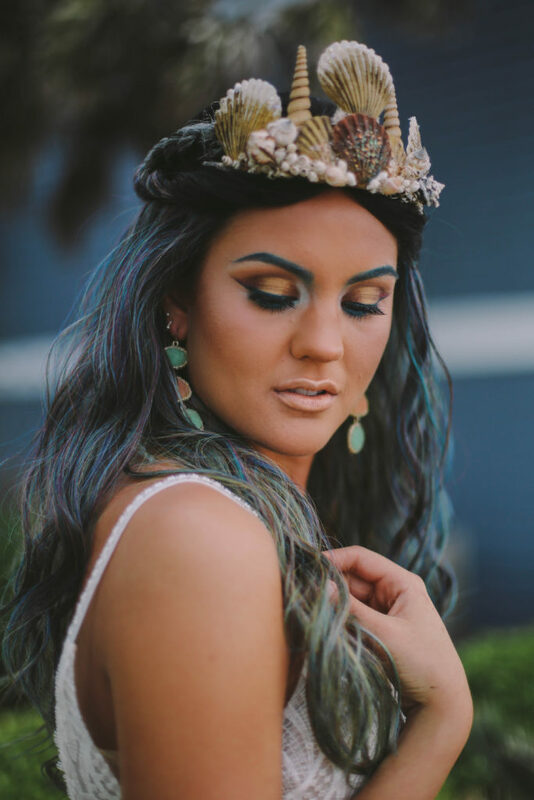 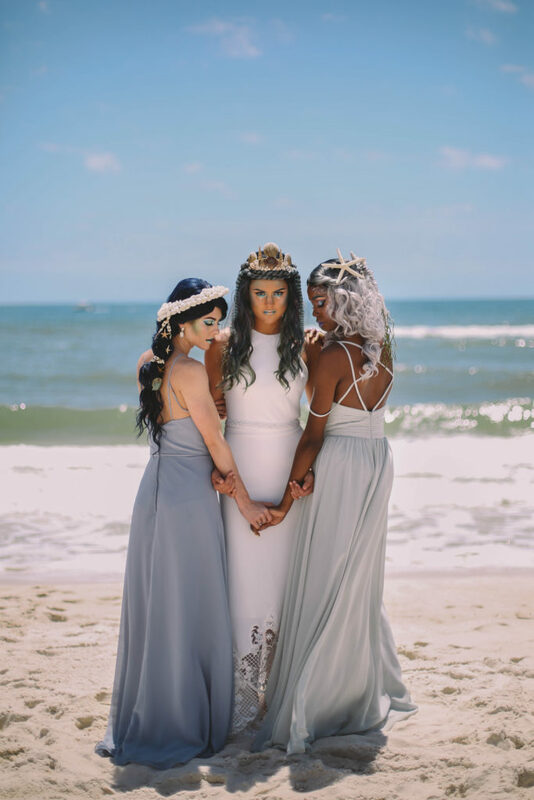 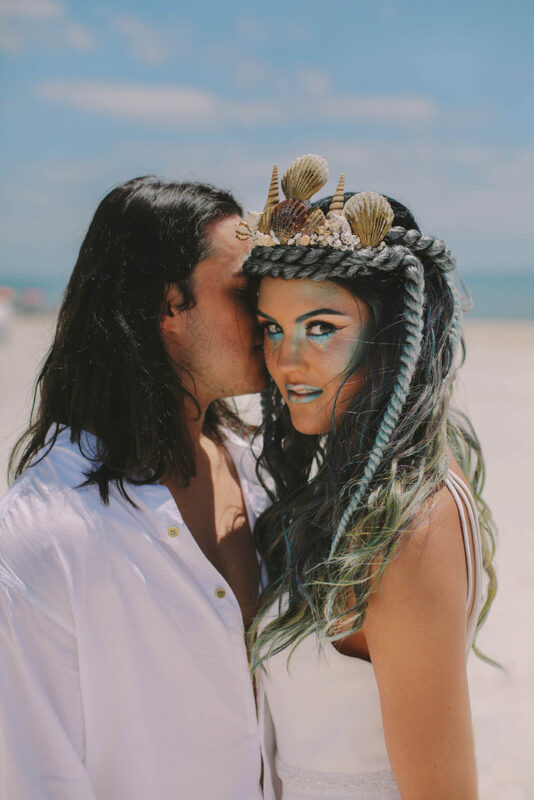 Combining modern coastal styling with ancient mythology, the I Do Y’all team created this beach wedding in a unique styled shoot to inspire ocean loving couples to think beyond the usual beach wedding style. 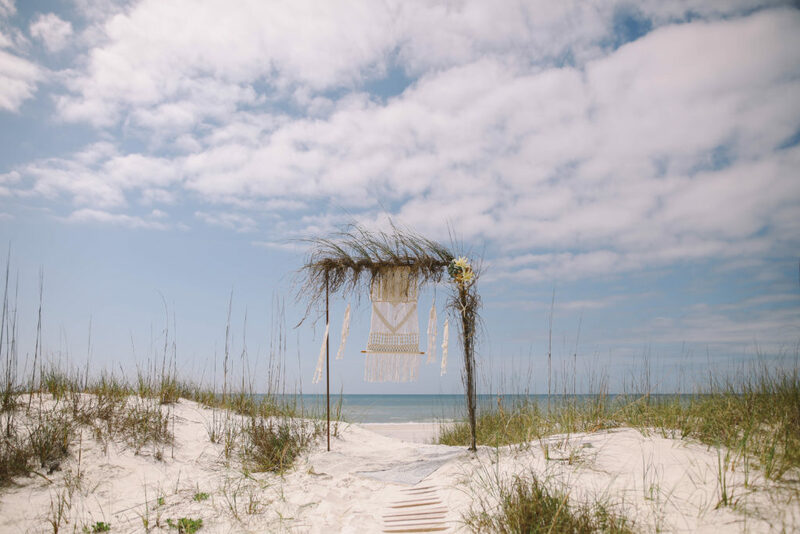 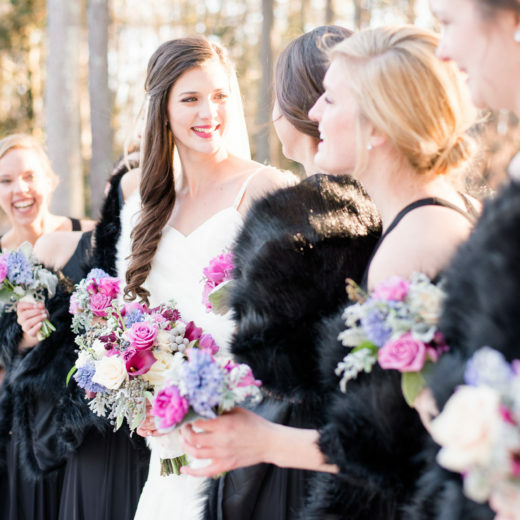 You won’t find the typical bamboo arbor draped in turquoise or peach fabric, or your ordinary beach-styled prefab look at this destination wedding. 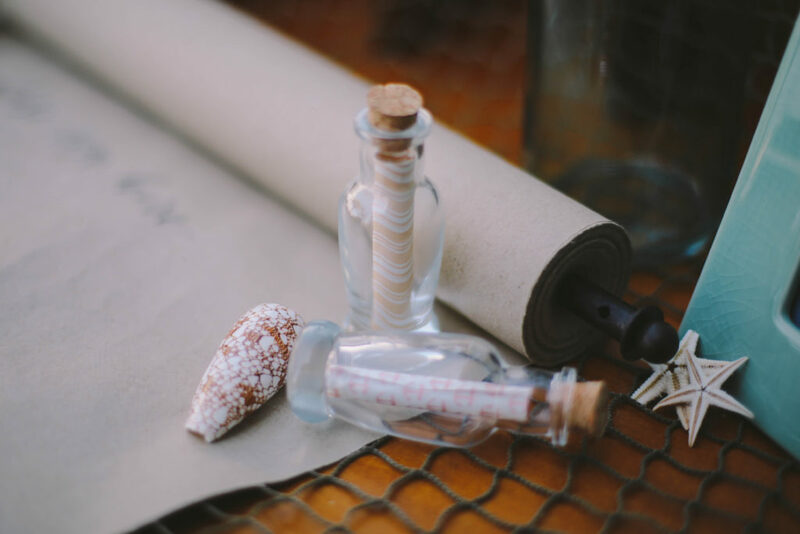 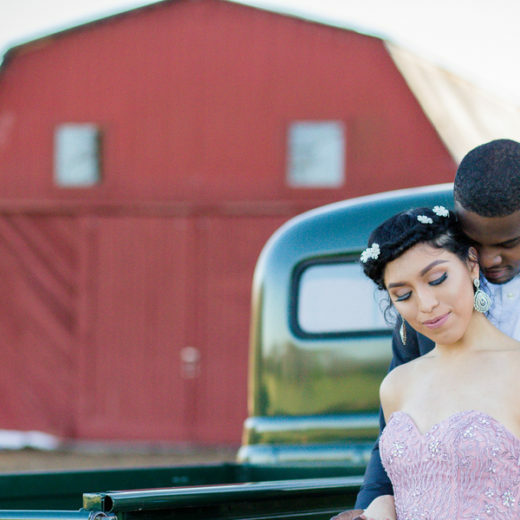 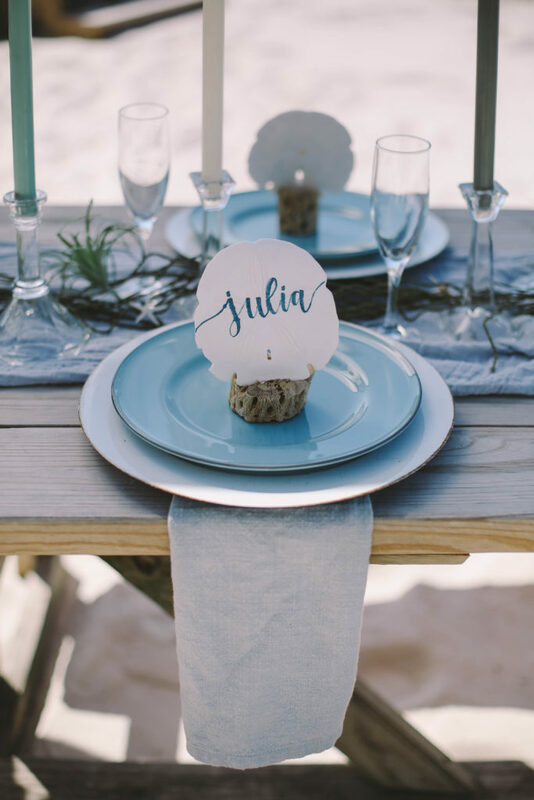 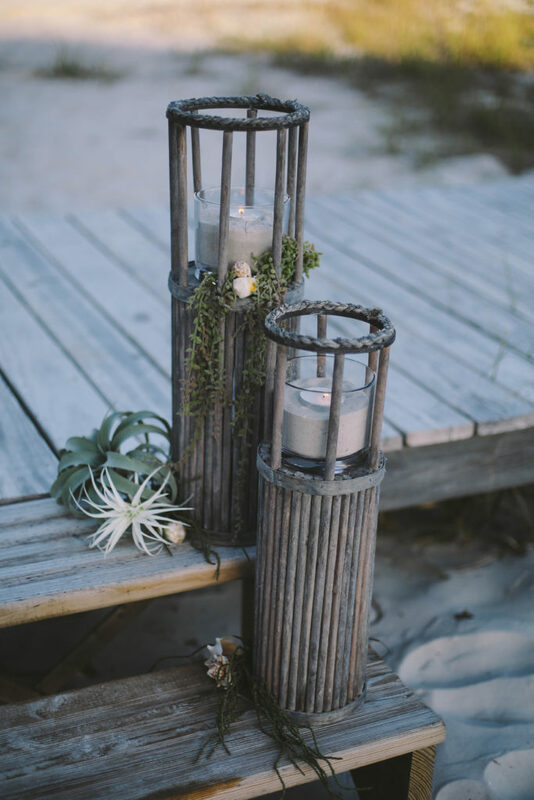 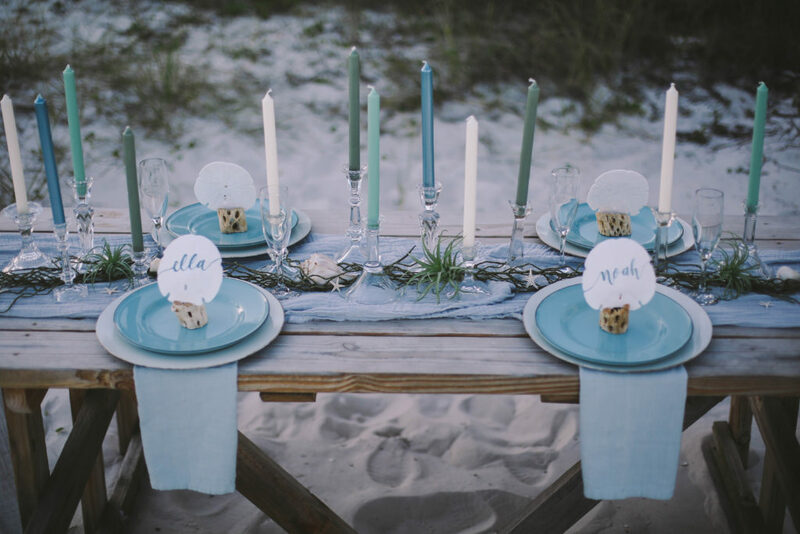 Instead, we opted for an organic coastal event with natural elements, boho styling and a sea glass palette. 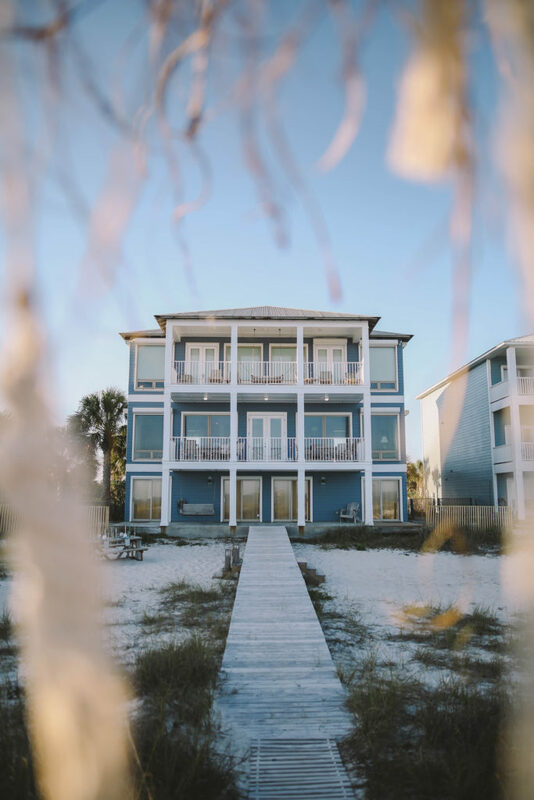 Our team partnered with Kaiser Realty by Wyndham who provided the incredible Delarna beach house which is part of the Nordic Villas wedding homes collection, a group of private homes regularly hosting beach front weddings. 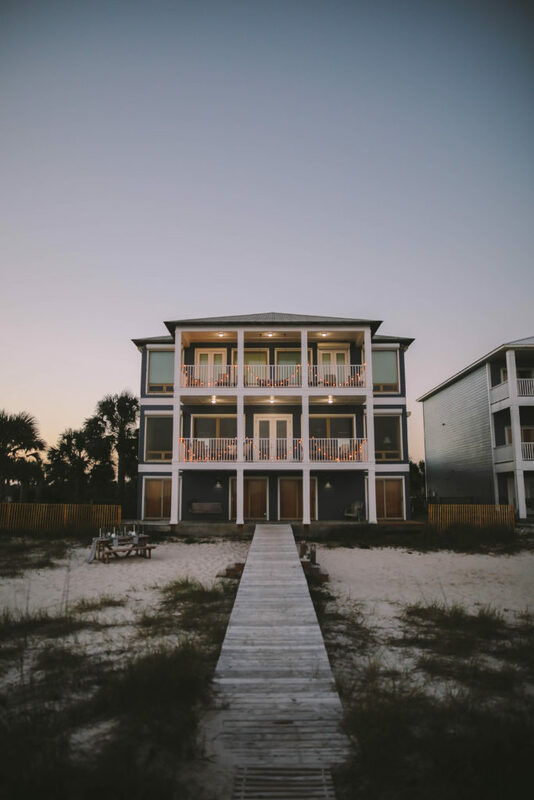 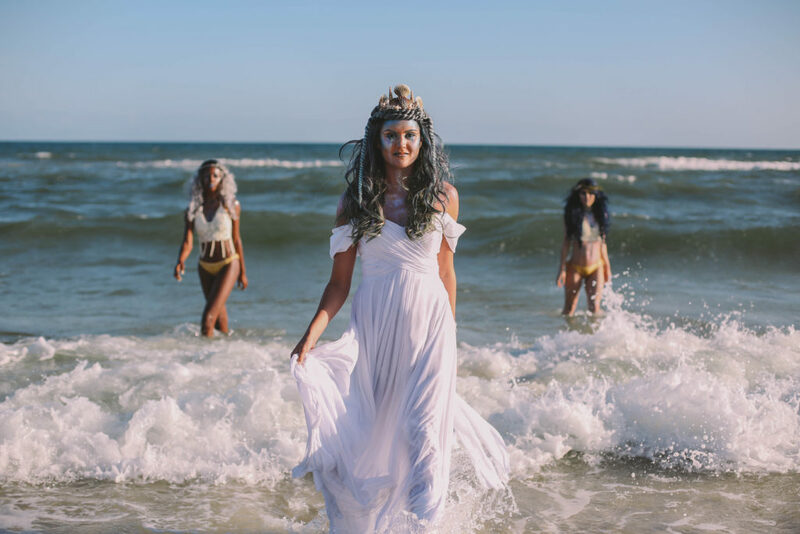 This amazing home sits on the sugar white sand of Orange Beach, Alabama where our “wedding” story begins with a mermaid and her siren sisters emerging from the depths in search of her soon-to-be-husband. 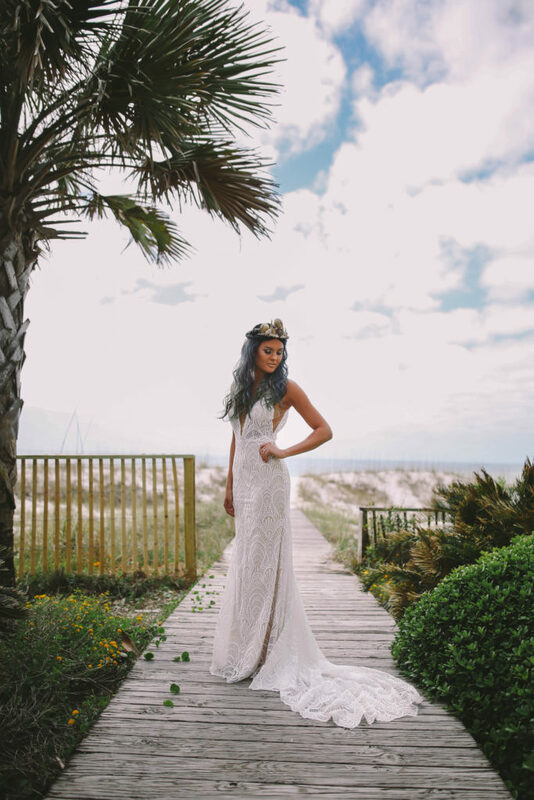 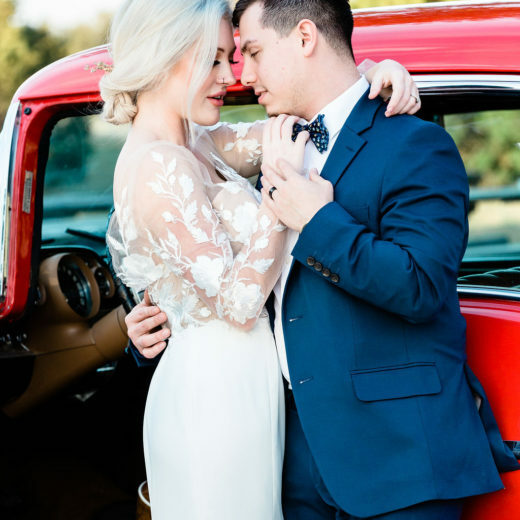 Our mer-ladies don a number of bridal looks until the perfect style is found. 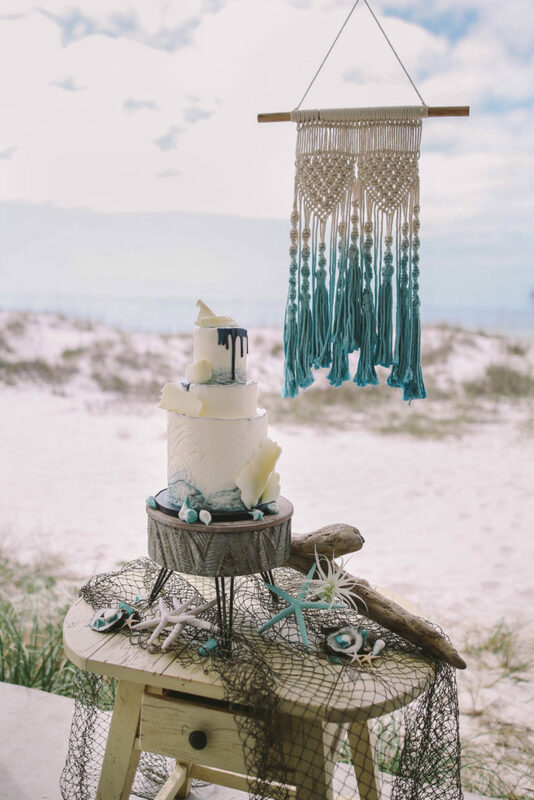 Meanwhile, a ceremony and reception regal enough for Poseidon’s daughter is prepared. 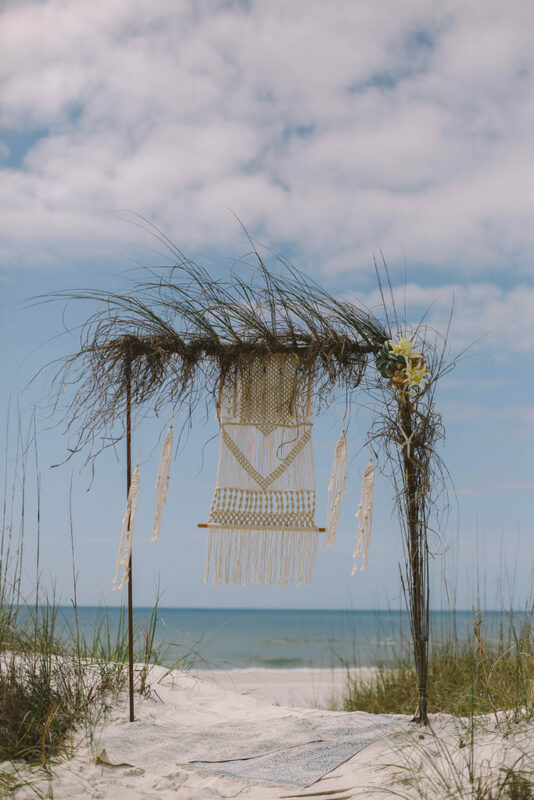 Our couple’s ceremony takes place under a copper pipe arch decorated with sea grasses, air plants, and macrame hangings. 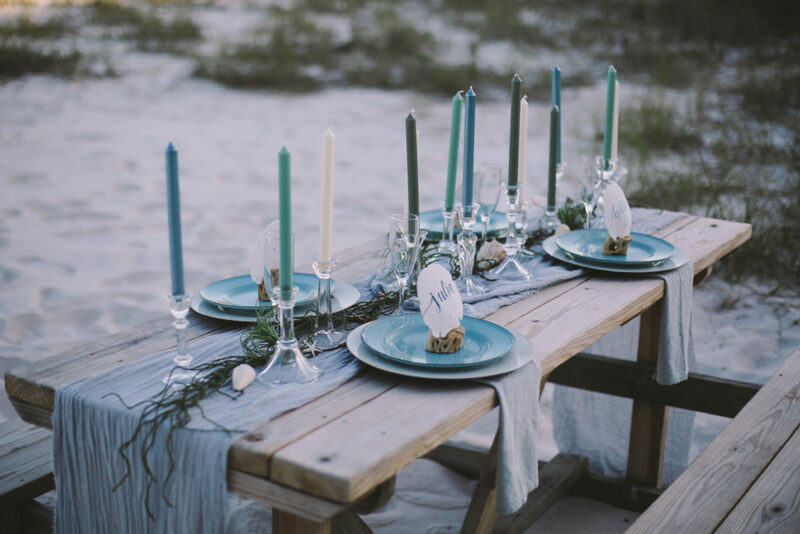 Reception tables are draped with sheer, gauzy fabrics and lined with sea glass colored candles in mismatched crystal candlesticks. 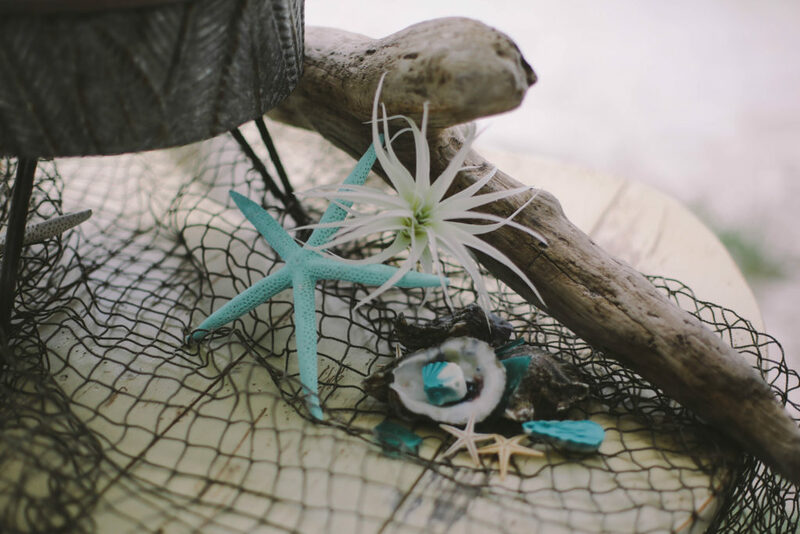 Large air plants, shells and tiny starfish we found lying on the beach are scattered across the table while sand dollars held in sea sponges serve as place cards. 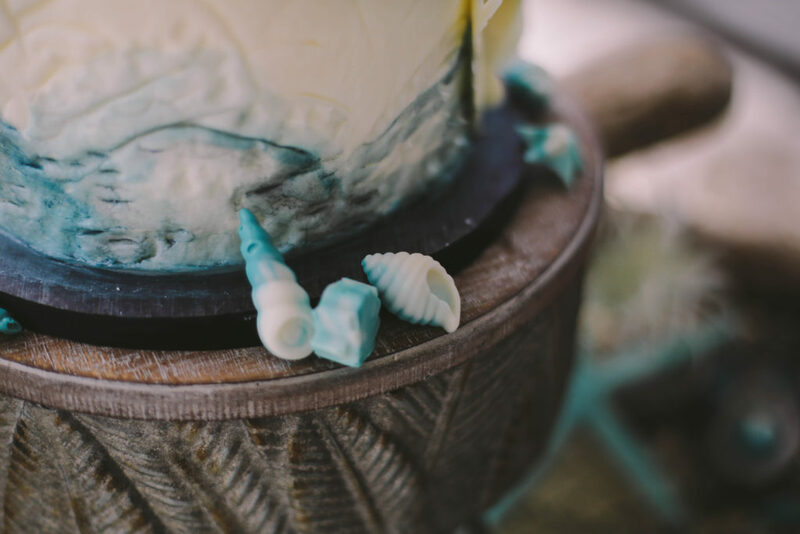 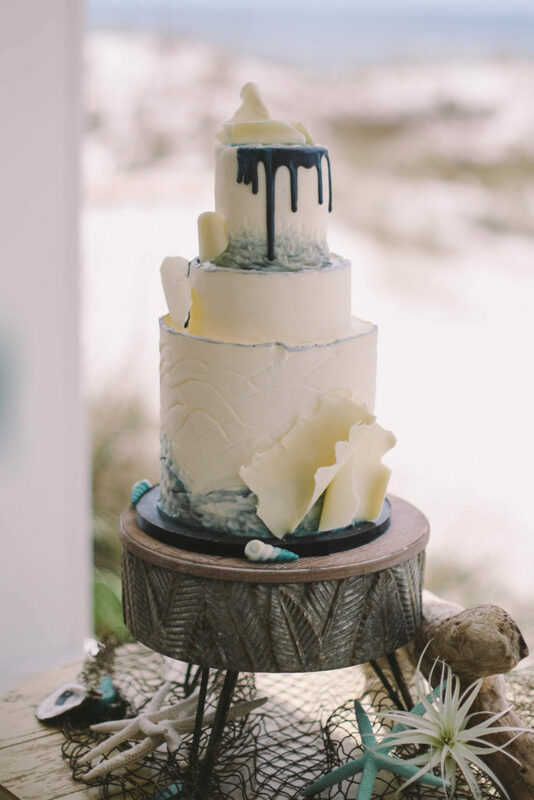 Twelve Five Cakery provided our wedding cake which is inspired by crashing waves and is accented by chocolate curls and candy shells and sea glass. 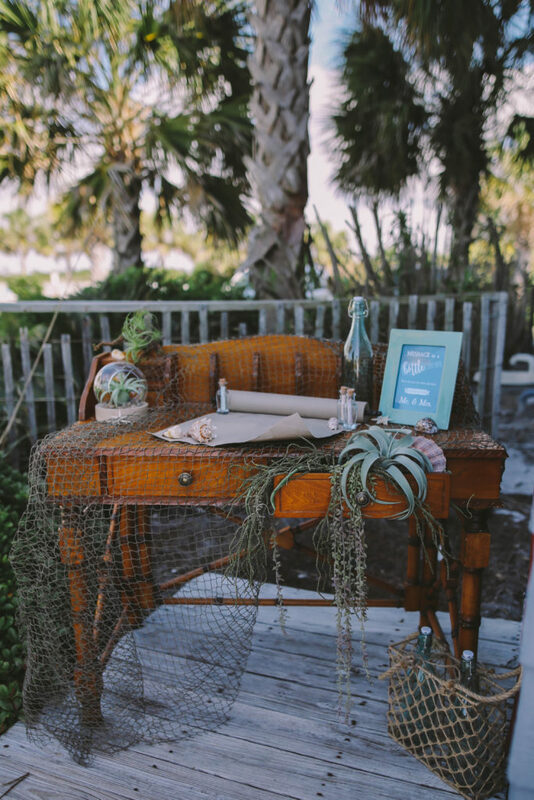 Furnishings from the home served as the guest sign-in table which was dressed with messages in bottles and a large scroll for guests to leave well wishes. 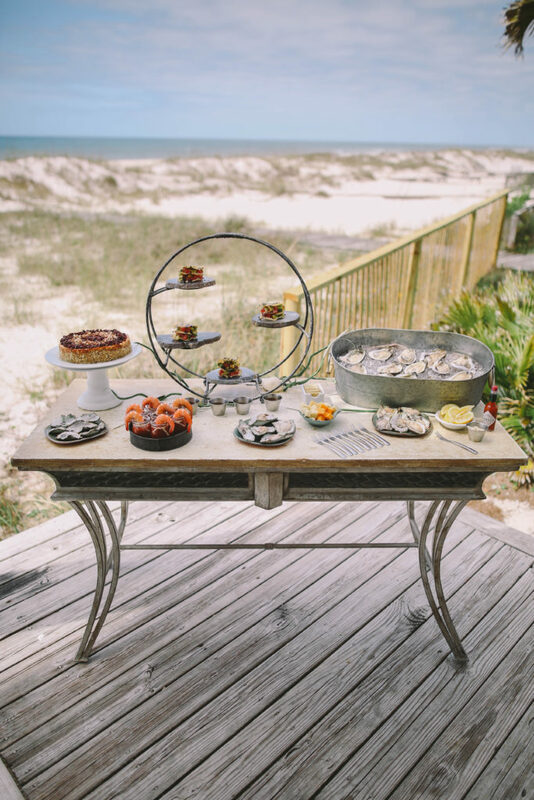 Additional tables were laden with seafood offerings fresh from the gulf, raw oysters, shrimp cocktail, and fresh tuna appetizers. 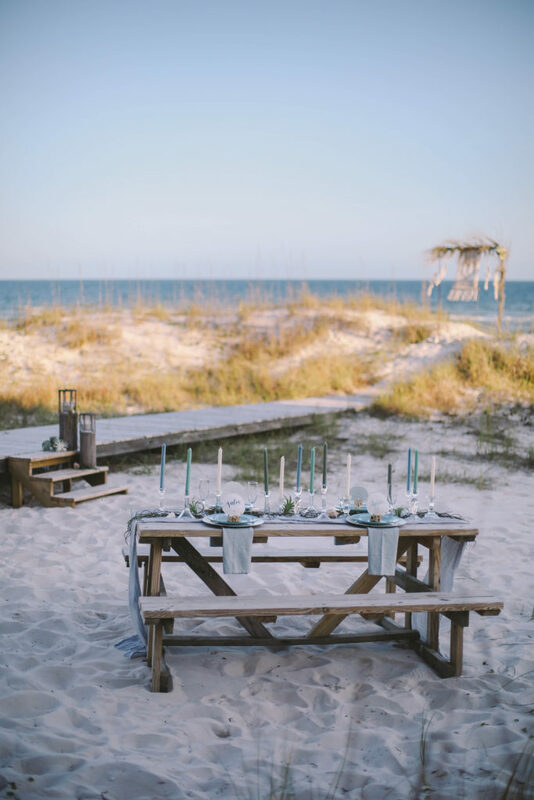 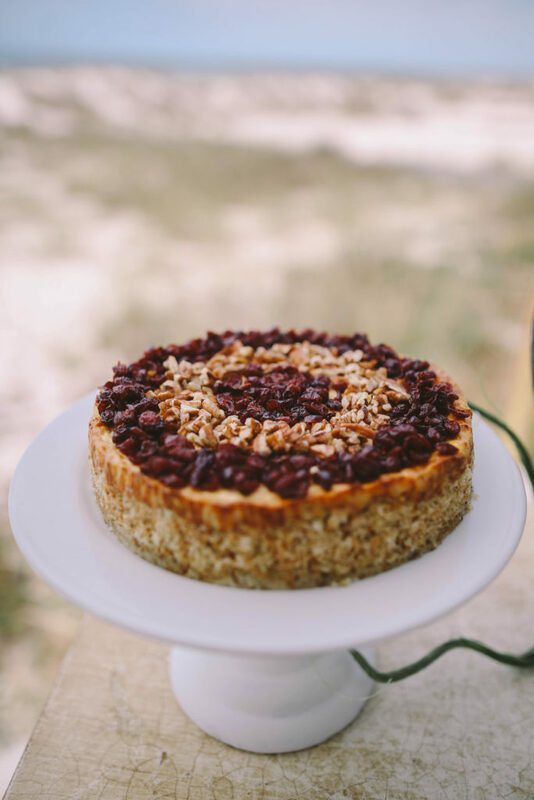 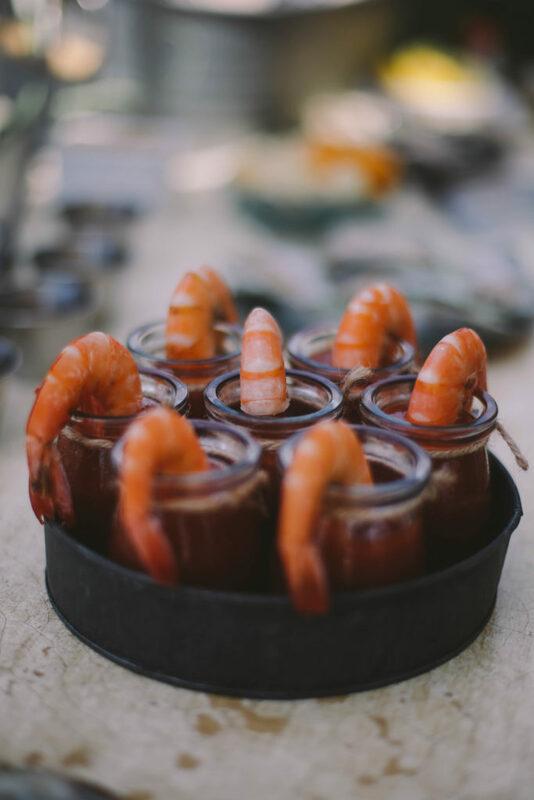 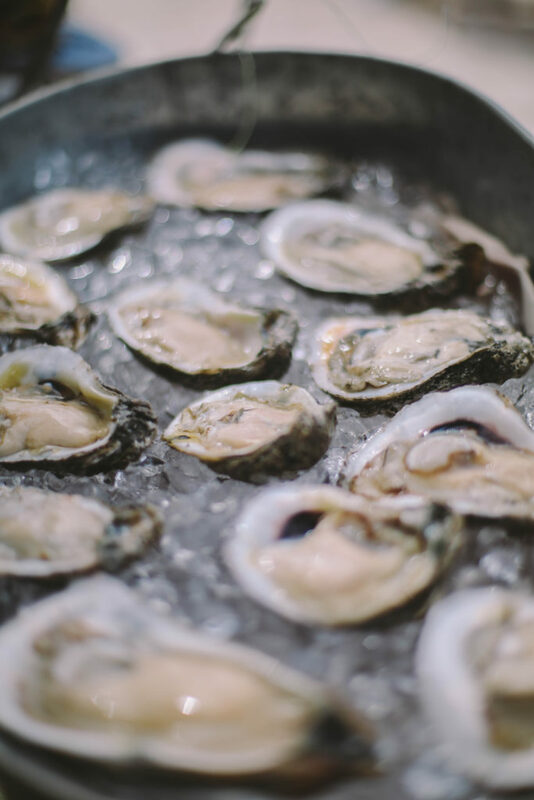 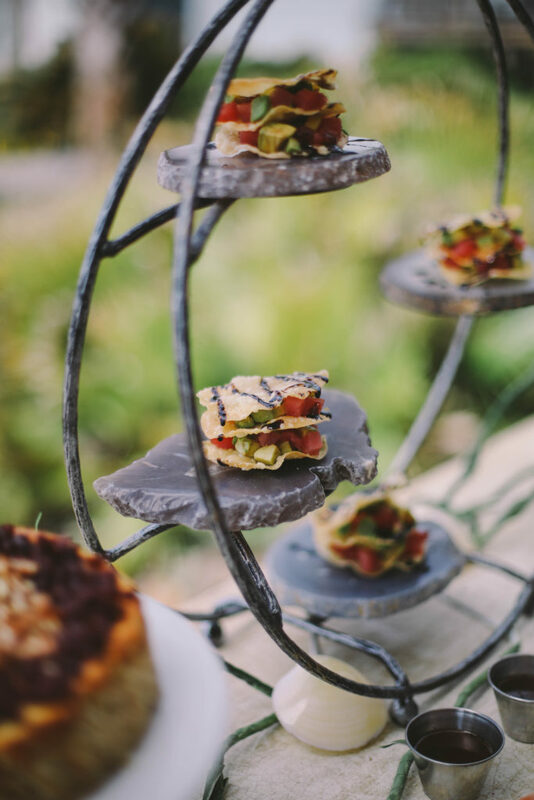 Like the overall design of the event, the food which was provided by Alabama Coastal Catering, was a reflection of the atmosphere of the Alabama gulf coast, laid-back luxury.